Isa 2:19,21; And they shall go into the holes of the rocks, and into the caves of the earth, for fear of the LORD, and for the glory of his majesty, when he ariseth to shake terribly the earth. To go into the clefts of the rocks, and into the tops of the ragged rocks, for fear of the LORD, and for the glory of his majesty, when he ariseth to shake terribly the earth. Isa 13:13; Therefore I will shake the heavens, and the earth shall remove out of her place, in the wrath of the LORD of hosts, and in the day of his fierce anger. Isa 24:23; Then the moon shall be confounded, and the sun ashamed, when the LORD of hosts shall reign in mount Zion, and in Jerusalem, and before his ancients gloriously. Isa 29:6; Thou shalt be visited of the LORD of hosts with thunder, and with earthquake, and great noise, with storm and tempest, and the flame of devouring fire. Isa 51:6; Lift up your eyes to the heavens, and look upon the earth beneath: for the heavens shall vanish away like smoke, and the earth shall wax old like a garment, and they that dwell therein shall die in like manner: but my salvation shall be for ever, and my righteousness shall not be abolished. Dan 8:10; And it waxed great, [even] to the host of heaven; and it cast down [some] of the host and of the stars to the ground, and stamped upon them. Joel 2: 30-32; And I will shew wonders in the heavens and in the earth, blood, and fire, and pillars of smoke. The sun shall be turned into darkness, and the moon into blood, before the great and the terrible day of the LORD come. And it shall come to pass, [that] whosoever shall call on the name of the LORD shall be delivered: for in mount Zion and in Jerusalem shall be deliverance, as the LORD hath said, and in the remnant whom the LORD shall call. Joel 3:15-16; The sun and the moon shall be darkened, and the stars shall withdraw their shining. The LORD also shall roar out of Zion, and utter his voice from Jerusalem; and the heavens and the earth shall shake: but the LORD [will be] the hope of his people, and the strength of the children of Israel. Eze 10:2; The LORD also shall roar out of Zion, and utter his voice from Jerusalem; and the heavens and the earth shall shake: but the LORD [will be] the hope of his people, and the strength of the children of Israel. Eze 38:20,22; So that the fishes of the sea, and the fowls of the heaven, and the beasts of the field, and all creeping things that creep upon the earth, and all the men that [are] upon the face of the earth, shall shake at my presence, and the mountains shall be thrown down, and the steep places shall fall, and every wall shall fall to the ground.And I will plead against him with pestilence and with blood; and I will rain upon him, and upon his bands, and upon the many people that [are] with him, an overflowing rain, and great hailstones, fire, and brimstone. Haggai 2:6,7, 21,22; For thus saith the LORD of hosts; Yet once, it [is] a little while, and I will shake the heavens, and the earth, and the sea, and the dry [land]; And I will shake all nations, and the desire of all nations shall come: and I will fill this house with glory, saith the LORD of hosts.Speak to Zerubbabel, governor of Judah, saying, I will shake the heavens and the earth; And I will overthrow the throne of kingdoms, and I will destroy the strength of the kingdoms of the heathen; and I will overthrow the chariots, and those that ride in them; and the horses and their riders shall come down, every one by the sword of his brother. Zech 14:4; And his feet shall stand in that day upon the mount of Olives, which [is] before Jerusalem on the east, and the mount of Olives shall cleave in the midst thereof toward the east and toward the west, [and there shall be] a very great valley; and half of the mountain shall remove toward the north, and half of it toward the south. Heb 12:25-29; See that ye refuse not him that speaketh. For if they escaped not who refused him that spake on earth, much more [shall not] we [escape], if we turn away from him that [speaketh] from heaven: Whose voice then shook the earth: but now he hath promised, saying, Yet once more I shake not the earth only, but also heaven. And this [word], Yet once more, signifieth the removing of those things that are shaken, as of things that are made, that those things which cannot be shaken may remain. Wherefore we receiving a kingdom which cannot be moved, let us have grace, whereby we may serve God acceptably with reverence and godly fear: For our God [is] a consuming fire. Jer 30:7 Alas! for that day [is] great, so that none [is] like it: it [is] even the time of Jacob’s trouble; but he shall be saved out of it. 1st Trumpet – Hail, fire, blood – 1/3 of earth, trees, green grass burnt up. The seven years begin. 7 years of the wrath of God is the 7th Church Age. Perhaps this trumpet is the trump for the Rapture, also. The seven years begin. Rev 8:8 Then the second angel sounded: And something like a great mountain burning with fire was thrown into the sea, and a third of the sea became blood. Rev 8:10Then the third angel sounded: And a great star fell from heaven, burning like a torch, and it fell on a third of the rivers and on the springs of water. Wormwood – many men died. Prov 5:4; But her end is bitter as wormwood, sharp as a twoedged sword. Jer 9:15;Therefore thus saith the LORD of hosts, the God of Israel; Behold, I will feed them, [even] this people, with wormwood, and give them water of gall to drink. Lam 3:15; He hath filled me with bitterness, he hath made me drunken with wormwood. Isa 13:10; For the stars of heaven and the constellations thereof shall not give their light: the sun shall be darkened in his going forth, and the moon shall not cause her light to shine. Eze 32:7,8; And when I shall put thee out, I will cover the heaven, and make the stars thereof dark; I will cover the sun with a cloud, and the moon shall not give her light. All the bright lights of heaven will I make dark over thee, and set darkness upon thy land, saith the Lord GOD. Joel 2:30-32; And I will shew wonders in the heavens and in the earth, blood, and fire, and pillars of smoke. The sun shall be turned into darkness, and the moon into blood, before the great and the terrible day of the LORD come. Joel 3:15; The sun and the moon shall be darkened, and the stars shall withdraw their shining. Zech 14:6-7; And it shall come to pass in that day, [that] the light shall not be clear, [nor] dark: But it shall be one day which shall be known to the LORD, not day, nor night: but it shall come to pass, [that] at evening time it shall be light. Rev 8:13 And I looked, and I heard an angel flying through the midst of heaven, saying with a loud voice, “Woe, woe, woe to the inhabitants of the earth, because of the remaining blasts of the trumpet of the three angels who are about to sound!” Note: Chapter 9 is the 1st woe, chapter 11 the second. Chapters 8 and 9 is how the Devil’s work appears on earth and in heaven. The 1st Woe begins when the 1st beast begins his work. The 5th trumpet sounds, the 1st woe ends, and the 2nd woe begins. Could this have been that day? 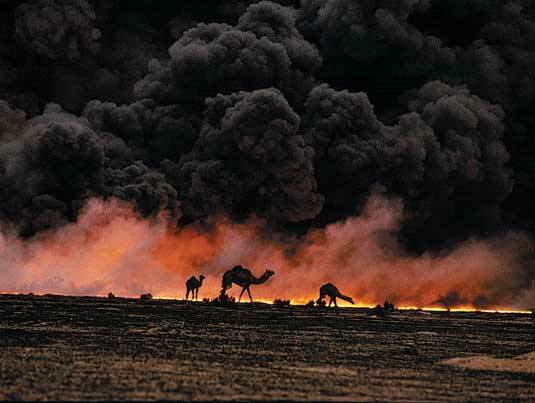 The 1990 Gulf War aftermath? Isa 24:17; Fear, and the pit, and the snare, [are] upon thee, O inhabitant of the earth. Joel 2:30-32; And I will shew wonders in the heavens and in the earth, blood, and fire, and pillars of smoke. The sun shall be turned into darkness, and the moon into blood, before the great and the terrible day of the LORD come. And it shall come to pass, [that] whosoever shall call on the name of the LORD shall be delivered: for in mount Zion and in Jerusalem shall be deliverance, as the LORD hath said, and in the remnant whom the LORD shall call. 1/5/16 http://defensetech.org/2016/01/04/u-s-navy-plans-to-fly-first-drone-swarm-this-summer/ The U.S. Navy is a leader in the area of swarm warfare, (LOCUST) the threat has been analyzed in a number of papers from the Naval Postgraduate School analyze the threat. Some of these are classified, but a 2012 paper by Loc Pham, “UAV Swarm Attack” is open and makes uncomfortable reading. With manned aircraft, the pilot’s life counts for a lot; but swarming drones are expendable and high “casualties” do not matter. This is a very different world to the dogfights we have seen before. When a swarm of drones heads for an American carrier some time in the future, they might be intercepted by a defensive swarm. What happens next — whether the aircraft on the carrier’s deck are destroyed, or whether the attackers are beaten off — will depend on which side has the best grasp of an entirely new form of warfare. Nahum 3:17; Thy crowned [are] as the locusts, and thy captains as the great grasshoppers, which camp in the hedges in the cold day, [but] when the sun ariseth they flee away, and their place is not known where they [are]. No Seal of God on Forehead means No Protection! Men will seek death but will not find it. Joel 2:4-5The appearance of them [is] as the appearance of horses; and as horsemen, so shall they run. Like the noise of chariots on the tops of mountains shall they leap, like the noise of a flame of fire that devoureth the stubble, as a strong people set in battle array. Nahum 3:15,17; Thy shepherds slumber, O king of Assyria: thy nobles shall dwell [in the dust]: thy people is scattered upon the mountains, and no man gathereth [them]. 17Thy crowned [are] as the locusts, and thy captains as the great grasshoppers, which camp in the hedges in the cold day, [but] when the sun ariseth they flee away, and their place is not known where they [are]. Rev 9:8 They had hair like women’s hair, and their teeth were like lions’ teeth. Jer 50:42;They shall hold the bow and the lance: they [are] cruel, and will not shew mercy: their voice shall roar like the sea, and they shall ride upon horses, [every one] put in array, like a man to the battle, against thee, O daughter of Babylon. Rev 9:10They had tails like scorpions, and there were stings in their tails. Their power was to hurt men five months. Chapter 10. A Parenthetical warning of the last 3 ½ years and the prophecy of the 2 witnesses who warn of the final wrath of God. The 6th and 7th angels to sound out yet. Eze 1:28 As the appearance of the bow that is in the cloud in the day of rain, so [was] the appearance of the brightness round about. This [was] the appearance of the likeness of the glory of the LORD. And when I saw [it], I fell upon my face, and I heard a voice of one that spake. Rev 10:3 and cried with a loud voice, as when a lion roars. When he cried out, seven thunders uttered their voices. Note: We will all know what they say when we are all together. This verse explains, to me, that the 6th and 7th Seals, Trumpets and Bowls go together. Verse 15:8 says, ‘….no one was able to enter the temple till the seven plagues were completed.’. This has led me to believe the 6th seal, 6th trumpet, 6th bowl, 1st and 2nd woes, are to occur simultaneously while the 7th seal, 7th trumpet, 7th bowl, and 3rd woe are all to occur simultaneously climaxing the finished work of God. John 19:30; When Jesus therefore had received the vinegar, he said, It is finished: and he bowed his head, and gave up the ghost. Eze 39:8; Behold, it is come, and it is done, saith the Lord GOD; this [is] the day whereof I have spoken. Eze 2:9; And when I looked, behold, an hand [was] sent unto me; and, lo, a roll of a book [was] therein; 10And he spread it before me; and it [was] written within and without: and [there was] written therein lamentations, and mourning, and woe. 3:1Moreover he said unto me, Son of man, eat that thou findest; eat this roll, and go speak unto the house of Israel. Eze 2:10And he spread it before me; and it [was] written within and without: and [there was] written therein lamentations, and mourning, and woe. 3:1; Moreover he said unto me, Son of man, eat that thou findest; eat this roll, and go speak unto the house of Israel. 2So I opened my mouth, and he caused me to eat that roll. 3And he said unto me, Son of man, cause thy belly to eat, and fill thy bowels with this roll that I give thee. Then did I eat [it]; and it was in my mouth as honey for sweetness. And he said unto me, Son of man, go, get thee unto the house of Israel, and speak with my words unto them. Eze 3:3 And he said unto me, Son of man, cause thy belly to eat, and fill thy bowels with this roll that I give thee. Then did I eat [it]; and it was in my mouth as honey for sweetness. Eze 3:4; And he said unto me, Son of man, go, get thee unto the house of Israel, and speak with my words unto them. Note: 4/18/07 Grant Jeffreys thinks an Israeli man. I did not believe it could be an Israeli until Ehud Barak and Ehud Olmert became leaders of Israel. Just kidding. Dan 8:20; The ram which thou sawest having [two] horns [are] the kings of Media and Persia. Dan 9:27; And he shall confirm the covenant with many for one week: and in the midst of the week he shall cause the sacrifice and the oblation to cease, and for the overspreading of abominations he shall make [it] desolate, even until the consummation, and that determined shall be poured upon the desolate. Dan 11:24; He shall enter peaceably even upon the fattest places of the province; and he shall do [that] which his fathers have not done, nor his fathers’ fathers; he shall scatter among them the prey, and spoil, and riches: [yea], and he shall forecast his devices against the strong holds, even for a time. 2 Thess 2:3-4; Let no man deceive you by any means: for [that day shall not come], except there come a falling away first, and that man of sin be revealed, the son of perdition; Who opposeth and exalteth himself above all that is called God, or that is worshipped; so that he as God sitteth in the temple of God, shewing himself that he is God. 1 Kings 18:38 (Some think this figure will claim to be Elijah) Then the fire of the LORD fell, and consumed the burnt sacrifice, and the wood, and the stones, and the dust, and licked up the water that [was] in the trench. A US weapons lab on Friday pulled back the curtain on a super laser with the power to burn as hot as a star. Dan 11:37-39 But in his estate shall he honour the God of forces: and a god whom his fathers knew not shall he honour with gold, and silver, and with precious stones, and pleasant things. But in his estate shall he honour the God of forces: and a god whom his fathers knew not shall he honour with gold, and silver, and with precious stones, and pleasant things. Neither shall he regard the God of his fathers, nor the desire of women, nor regard any god: for he shall magnify himself above all. 4/24/14 http://www.shtfplan.com/headline-news/the-mark-scientist-claims-human-microchip-implants-will-become-not-optional_04242014 [Rev 13:16-18 KJV] And he causeth all, both small and great, rich and poor, free and bond, to receive a mark in their right hand, or in their foreheads: And that no man might buy or sell, save he that had the mark, or the name of the beast, or the number of his name. Here is wisdom. Let him that hath understanding count the number of the beast: for it is the number of a man; and his number [is] Six hundred threescore [and] six. 6/1/12 http://www.nydailynews.com/news/national/human-barcode-society-organized-invades-privacy-civil-liberties-article-1.1088129 ‘Human barcode’ could make society more organized, but invades privacy, civil liberties. As tech companies work to develop ID chips, how long until we’re no longer anonymous? Chapter 11 – The Two Witnesses (they have 3 ½ years). The two olive trees = The two lampstands standing before God, They are the 2nd Woe. I believe the 3rd Woe is when our Lord Returns. They begin their witnessing at the time the 2nd beast begins his reign. The 6th Seal 6:12, 6th Trumpet 9:13 and 6th Bowl 16:12 will happen during this last 3 ½ years (of the 7 years Dan 9:27) that the Two Witnesses have, 2nd Seal 11:3. Then the 7th Seal is opened. This temple in Revelation and the one in Ezekiel 40 – 41, are beyond me to understand as far as anything but comfort. Dan 7:25; And he shall speak [great] words against the most High, and shall wear out the saints of the most High, and think to change times and laws: and they shall be given into his hand until a time and times and the dividing of time. Dan 12:7; And I heard the man clothed in linen, which [was] upon the waters of the river, when he held up his right hand and his left hand unto heaven, and sware by him that liveth for ever that [it shall be] for a time, times, and an half; and when he shall have accomplished to scatter the power of the holy people, all these [things] shall be finished. The 1st – 6th Vials (Bowls) occur during their witness. Isa 10:20; And it shall come to pass in that day, [that] the remnant of Israel, and such as are escaped of the house of Jacob, shall no more again stay upon him that smote them; but shall stay upon the LORD, the Holy One of Israel, in truth. Zech 4:3And two olive trees by it, one upon the right [side] of the bowl, and the other upon the left [side] thereof. 6 Then he answered and spake unto me, saying, This [is] the word of the LORD unto Zerubbabel, saying, Not by might, nor by power, but by my spirit, saith the LORD of hosts. 11Then answered I, and said unto him, What [are] these two olive trees upon the right [side] of the candlestick and upon the left [side] thereof? Zech 4:2-3; And said unto me, What seest thou? And I said, I have looked, and behold a candlestick all [of] gold, with a bowl upon the top of it, and his seven lamps thereon, and seven pipes to the seven lamps, which [are] upon the top thereof: And two olive trees by it, one upon the right [side] of the bowl, and the other upon the left [side] thereof. Rev 11:6 These have power to shut heaven, so that no rain falls in the days of their prophecy; and they have power over waters to turn them to blood, and to strike the earth with all plagues, as often as they desire. Rev 11:9 Then those from the peoples, tribes, tongues, and nations will see their dead bodies three-and-a-half days, and not allow their dead bodies to be put into graves. Rev 11:10 And those who dwell on the earth will rejoice over them, make merry, and send gifts to one another, because these two prophets tormented those who dwell on the earth. Rev 11:11Now after the three-and-a-half days the breath of life from God entered them, and they stood on their feet, and great fear fell on those who saw them. Rev 11:12And they heard a loud voice from heaven saying to them, “Come up here.” And they ascended to heaven in a cloud, and their enemies saw them. Perhaps the remaining Jews converted here: ‘gave glory to God of heaven. Isa 2:19 And they shall go into the holes of the rocks, and into the caves of the earth, for fear of the LORD, and for the glory of his majesty, when he ariseth to shake terribly the earth. 21 To go into the clefts of the rocks, and into the tops of the ragged rocks, for fear of the LORD, and for the glory of his majesty, when he ariseth to shake terribly the earth. Isa 24:23; Then the moon shall be confounded, and the sun ashamed, when the LORD of hosts shall reign in mountZion, and in Jerusalem, and before his ancients gloriously. Eze 38:20,22; So that the fishes of the sea, and the fowls of the heaven, and the beasts of the field, and all creeping things that creep upon the earth, and all the men that [are] upon the face of the earth, shall shake at my presence, and the mountains shall be thrown down, and the steep places shall fall, and every wall shall fall to the ground. And I will plead against him with pestilence and with blood; and I will rain upon him, and upon his bands, and upon the many people that [are] with him, an overflowing rain, and great hailstones, fire, and brimstone. Haggai 2:6,7, 21,22; For thus saith the LORD of hosts; Yet once, it [is] a little while, and I will shake the heavens, and the earth, and the sea, and the dry [land]; And I will shake all nations, and the desire of all nations shall come: and I will fill this house with glory, saith the LORD of hosts.